Reed's Island is a Hilo neighborhood where the wealthy built their homes in a bygone era, and it still holds that reputation today. The Falls at Reed's Island is at the very end of the island's only road, giving it the most prestigious and secluded setting on the island. The estate occupies two and a quarter acres which allows your senses to take in a multi acre aura of sights, sounds and scents. Vacation Rental in Hawaii - The Falls at Reed's Island, was one of four properties featured in The New York Times - "Secluded Retreats on the Big Island" and was featured on the TV special - "Around the World in 80 Homes" produced by the Fine Living Channel, owned by the same folks that bring you HGTV - Home and Garden TV. 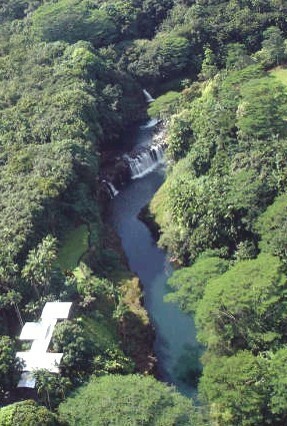 The Falls at Reed's Island is about 1 mile from old historic Hilo town and Hilo Bay “The Beautiful Bayside City”. The land is more vertical than horizontal, a sliver with about 700' of frontage on the Wailuku River, the largest river in the State. It is protected by a fragment of State land on its side away from the river, and the land across the river is protected by a conservation easement. When on the property, it seems deep in the rain forest, although it is really in downtown Hilo. Designed by San Francisco architects David Morton and Thomas Cordell, as their private vacation home in Hawaii. Completed in 2002, the narrowness of the site dictated the uniqueness of the house layout, three comfortable private bedrooms with baths, surrounded with large windows opening into the magical rain forest setting. A kitchen building, a pavilion with large windows on all sides surveying, as from a crow's nest, the two gorges and the waterfall. The three buildings are joined by a long screened lanai, with a colonnade of posts made of native Ohia tree trunks. Interior wood is untreated Port Orford cedar from Oregon which has a pleasant aroma. Over eons of time the river eroded the gorge down on the North side of the island to a level of about 85 feet below the island, leaving the South gorge high and dry about 30 feet below the island. With cliffs flanking both sides, this dry channel is an ideal site for a garden, the bottom is a near level grass area. It undulates the length of the property, culminating beyond the tip of the old island at a cliff overlooking the active North gorge and a grand waterfall directly below. The house exterior is mostly black, with black anodized aluminum windows giving the feeling that the house emerges from the black lava rocks below. Vacation Rental Hilo Hawaii - The Falls at Reed’s Island is the Hawaii Vacation Rental Home for your next, or first, trip to the big island. Built on the pinnacle of Reed's Island with a stunning backdrop of rugged lava cliffs, a quilt work of lush tropical foliage and of course your private waterfall on the Wailuku River, all providing a soul-stirring oasis in which to return to each evening, “feels like being on your own private island”. Historically home for the Hawaiians was not on the beach, they lived in the valleys where the weather was appealing, inspirational, serene. Legend has it that Reed’s Island, (original name “Koloiki”) was the play ground of the Alii (Royalty). If you are considering a Hawaii beach vacation rental, a hotel, or condo imagine staying in what seems to be deep in a rainforest, but just a mile up river of Hilo Bay, where a Hawaiian King spent his time. "I have never been in so lovely a setting and been able to enjoy it with such perfect intimacy and privacy."